Calcium ions are known to play a role in many aspects of cell function, but gaps exist in the understanding of calcium's role in the cell cycle. Research led by Professor Mike White and Dr. Violaine Sèe at the University of Liverpool used targeted flash photolysis to elucidate intracellular calcium's role in signaling the cell to progress through the cell cycle. Figure 1. Single cell illumination of Swiss 3T3 cells loaded simultaneously with NP-EGTA (caged calcium) and Fluo-4 (calcium dye). The arrow indicates the illuminated cell (A) before illumination and (B) during illumination. The increase of fluorescence indicates calcium release in the illuminated cell. (C) Thirty seconds after illumination, calcium levels are back to basal levels. Image courtesy of Dr. Violaine Sèe, University of Liverpool. D-type cyclins such as CD1 are known to play an important role in cell cycle progression. Its level varies during cell cycle, and the amount of CD1 protein is directly dependent on the rate of CD1 gene transcription. CD1 gene transcription is regulated by multiple transcription factors, including nuclear factor kappa B (NF-kB), which can control cell growth and differentiation through transcriptional regulation of CD1. Even though NF-kB appears to play a role in cell cycle progression, the intracellular events leading to this transcription factor's activation upon growth factor stimulation are unknown. Stimulation of non dividing cells with growth factors or mitogens causes a transient rise in intracellular free calcium concentration. Intracellular calcium has been shown to play a role in the G1/S and G2/M phases of the cell cycle, but the University of Liverpool researchers wanted to find out more about its role in the G0-G1 transition. Using targeted photolysis to uncage a calcium chelator and a calcium donor in living cells allowed them to observe how the cells responded to precisely-timed absence of (normally-present) calcium signals and increases in calcium levels. This allowed them to understand the role that calcium plays in CD1 gene transcription and subsequent cell proliferation. To study the long-term role of the serum-induced intracellular calcium increase, the researchers needed a noninvasive method to eliminate this transient increase. They used the caged calcium scavenger Diazo-2. Its normally low affinity to calcium increases 30-fold when illuminated at 360 nm. To eliminate the serum-induced calcium peak, they applied the illumination to Diazo-2-loaded cells just after serum induction. The Diazo-2 photolysis inhibited the serum-induced calcium peak without effecting subsequent intracellular calcium levels. The researchers used the MicroPoint system to uncage Diazo-2 in a cell of interest by exposing it to a train of 4 s flashes of 360 nm light over 10 s. They performed simultaneous imaging and photostimulation of the specimen, and could therefore follow the targeted cells and normal cells with time-lapse confocal microscopy. In this way they directly monitored the effects of uncaging on intracellular signaling and cell fate. As Violaine Sèe explains, they did not detect NF-kB translocation into the nucleus or NF-NF-kB-dependent gene transcription from the NF- kB consensus and CD1 promoters in the targeted cells. These facts suggested that the serum-induced calcium peak appears to signal the down-stream events. Figure 2. 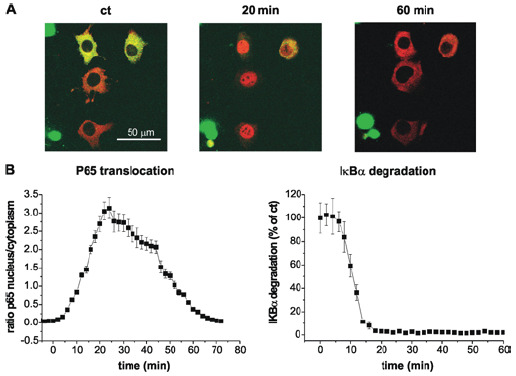 Serum stimulation promotes p65 translocation into the nucleus as well as IκBα degradation. To further study the relationship between the transient calcium increase and later NF-kB activation, they performed targeted photolysis of the caged calcium donor NP-EGTA. Activated NP-EGTA causes a 22% transient increase in intracellular calcium. This increase is of the same magnitude as the serum-stimulated increase, but it did not induce detectable p65 translocation to the nucleus. The result of suppressing and replicating serum-induced calcium peaks using caged molecules suggested that NF-kB translocation and downstream regulation of gene transcription depends on a transient increase of intracellular calcium, but other serum-dependent signals are required to activate NF-kB. These results, combined with other experiments, led the researchers to propose that the G0-G1 transition depends on mitogenic kinase activity as well as calcium signaling and that NF-kB activation has a critical role in the transduction of these mitogenic signals to the nucleus. "The work showed that calcium has a lead role in cell cycle. Calcium ions have been implicated in many aspects of cell function, but its role in the cell cycle was not well described," said Violaine Sèe. "We found that calcium can initiate the cell cycle through activation of the mitogen-activated protein kinase-NF-kB pathway."